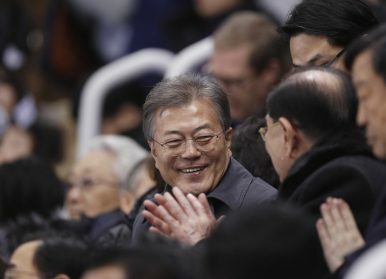 South Korean President Moon Jae-in, left, smiles as he talks to Kim Yong-nam, the 90-year-old president of the Presidium of the North's Parliament, during the third period of the preliminary round of the women's hockey game between Switzerland and the combined Koreas at the 2018 Winter Olympics in Gangneung, South Korea, Saturday, Feb. 10, 2018. Seoul brought Pyongyang in from the cold for the Olympics, putting President Moon at the helm of peninsular affairs. South Korea’s President Moon Jae-in has been the real winner of the PyeongChang Winter Olympic Games so far. Many analysts have focused on Kim Yo-jong’s visit to South Korea and Pyongyang’s alleged propaganda blitz. However, it is Seoul that has really set the agenda in recent weeks as far as inter-Korean relations go. And Seoul now sits in the driving seat of Korean Peninsula affairs. Recent diplomatic moves around the PyeongChang games have thus actually been Moon’s propaganda coup. To begin with, it should be made clear that North Korea’s participation in the games was of the Moon government’s making. The president spent months publicly calling for North Korea to send a sports delegation to the games. His government and the games’ organizing committee have been working behind closed doors to reach out to North Korea whenever and wherever they could, sometimes by themselves and also in cooperation with others, including the International Olympic Committee. In a sense, Seoul has brought Pyongyang in from the cold after a year of North Korean missile and nuclear tests that threatened to make high-level engagement impossible in the near future. Months of hard work have been rewarded with a diplomatic victory for the Moon government. In terms of soft diplomacy, the sight of both Koreas marching together during the Opening Ceremony under the unified Korean flag was a powerful and moving image. It was not the first time they have marched together, but it was more meaningful because it took place on South Korean soil. Meanwhile, the unified women’s ice hockey team has been a success, despite some initial criticism in South Korea about the idea. South Korea was very unlikely to win a medal in the sport in any case. Thanks to the unified team, there is a now a powerful metaphor about South and North Koreans quickly blending together – regardless of the team’s heavy losses to better squads. It is at the high table where Moon’s diplomatic move is likely to have greater immediate significance though. Kim Yo-jong’s visit was very successful from a South Korean perspective. Hopes might not have been especially high, but the fact that Moon and Kim shook hands in front of possibly hundreds of millions of people watching the games’ Opening Ceremony sent a powerful message. Subsequent meetings and an invitation for Moon to visit North Korea were also very meaningful. Kim Jong-un’s public thanks to South Korea for the way it handled the visit was as well. In a matter of days, Moon has made the possibility of an inter-Korean summit and warming ties a no-brainer. This seemed fanciful only a few weeks ago. With regards to the United States and Japan, hawks in both countries have had a bad week. U.S. Vice President Mike Pence went to the games to, in his own words, counter North Korean propaganda. Following criticism for not standing up as the joint Korean team paraded during the Opening Ceremony, Pence’s absence from the official high-level Olympic guest picture, and only attending the official reception for five minutes, he penned an article stating that Washington is open to dialogue with Pyongyang. It should be remembered that the discussion a few weeks ago centered on the possibility of a “bloody nose” strike on North Korea’s missile and nuclear facilities. As for Japan, Prime Minister Shinzo Abe’s call to maintain maximum pressure on North Korea and for the United States and South Korea to conduct their regular joint military drills as soon as possible have barely been noticed. His absence from the Olympic guest picture was likewise ignored. The United States and Japan thus cast a lonely shadow on the games. Right now, Seoul is in control of inter-Korean relations – which is of utmost importance to South Koreans, who sometimes feel that it is the United States, North Korea, or even China who do so. In terms of relations between North and South, it is up to Pyongyang to make the most of the engagement olive branch that the Moon government has extended. Furthermore, it is Moon’s decision whether to accept North Korea’s invitation for a summit or not. Seoul can switch off the engagement button if displeased with Pyongyang, even if it leads to a new round of North Korean tests. Meanwhile, Washington is supportive of the inter-Korean détente and has openly stated – or some would say, reiterated – its willingness to meet with Pyongyang. China seems to be happy to let both Koreas sort out their differences. It has become abundantly clear in recent years that Beijing holds almost no leverage over Pyongyang. The Xi Jinping government hopes that Moon’s rapprochement policy will hold more sway over Kim Jong-un. Domestically, recent developments have legitimized further talks and engagement with North Korea. Certainly, many South Koreans consider a significant breakthrough in inter-Korean relations unlikely and do not really trust Pyongyang. But Moon ran for election unequivocally calling for the resumption of engagement. And this approach has now yielded positive results. Therefore, he has the political capital to at least try this policy out in earnest. His approval ratings might have taken a dip, but his popularity remains very high. Moon’s propaganda coup is thus probably leading us to a period in which Seoul will dictate Korean Peninsula developments. This will mean giving talks and engagement a chance. Whether this will have any significant impact is yet to be seen. But the PyeongChang games have served to open a window of opportunity that the Moon government would like to take advantage of. Dr. Ramon Pacheco Pardo is Korea Chair at the Institute for European Studies of Vrije Universiteit Brussel and Senior Lecturer at King’s College London. North Korea's upcoming Olympics appearance is both an opportunity and a challenge for South Korea, Japan, and the U.S.